Profile: Once Unicron's most dangerous lieutenat and herald, Ramjet found great joy in his role as the vanguard of the chaos-bringer's assault on reality after reality. his skill as a warrior twisted by the corrupting energies of the dark god into a deep love of the cruelty and destruction, Ramjet grew ever apart from his fellow Decepticons into a creature as unique as any in the Multi-verse. Grated obscene might through a direct, inter-dimensional link to Unicron, Ramjet was free to vent his twisted desire on the inhabitants of the dimensions to which he traveled, often tortuing and destroying the populations of entire planetary systems as a means of annoyncing the imminent arrival of Unicron. Despite his chaotic nature, his greatest fear was the failure of the Unicron-empowered guidance systems that allowed him to punch through the fabric of realities and navigate the vertiginous nowhere between dimensions. Always a servant of annimilation, and ever one step ahead of it, Ramjet loved and hated his lord Unicron. His words fears were realized when Unicron's physical form imploded near Cybertron during the Powerlinx Battles, imprisoning the god's essence within a vast new black hold created by the catastrophic collapse of local space-time. Ranjet, travelling to his lord's aid, was cast adrift between dimensions. Ramjet found himself lost in a kalediscopic madness of swirling anti-matter, a timeless non-space in which atomic cohesion and ordered mathematics are nonsense. He quickly found himself losing physical cohesion as the environment converted his material structure to scattered energy, and he became for a moment a small, bright start in a sea of chaos. But worse, as his core systems began to fail, he found that he was not alone. There were things here. Beings of ancient, indescribable power; monsters of a cold, alien evil that dwarfed even Unicon. They invaded Ramjet's being, recreated and destroyed him a thousand times, toyed with his Spark like a cruel, dangerous child might toy with a neglected pet. It was an eternity of torture taht negated every aspect of Ramjet's being, until eventually, bored or sastified with what they had done, these ancient gods cast Ramjet out of their domain, back into the Universe. Abilities: Reamjet's most impressive ability in his capacity to generate quantum fields intense enough to collapse space-time in upon itself, creating semi-stable extra-dimensional wormholes from one reality to another. The creation of these wormholes is extremely energy intensive, and it can take some time for Ramjet to generate sufficent distortion fields. Destroyed and recreated over and over again during his imprisonment, Ramjet's corporeal form is constructed from highly radioactive unstable antimatter, held together by the force of his will. As a result, he has access to nearly unlimited energy. The interaction of normal matter with the surface of his skin causes him to be surrounded by a constant halo of matter annihilation, the energy output of which is harvested by startling efficiency by subdermal energy collectors. His own anti-atoms are replenished constantly via inter-dimensional bleed from non-space. He is able to channel part of his physical form into focused antimatter blasts, which can destory almost anything they hit. Overuse of this capability weakens him considerably, however, so he rarely uses it, preferring instead to employ his more conventional plasma pulse cannons and high energy shock blade. 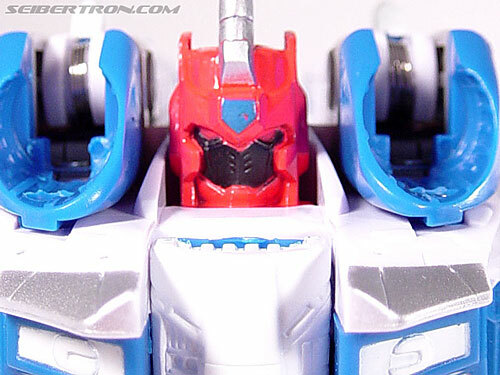 Defensively, Ramjet is accompanied constantly by a swarm of Mini-Cons that have devolved over time into little more than mindless drones, devoted to protecting their master. More formidable is the fact that his mere touch can destroy most opponents in a violent matter/antimatter reaction. Weaknesses: Aside from the fact that he's as crazy as a Quint in a Sharkticon pit, Ramjet's weaknesses are few and difficult to exploit. Chief among them is the fact that he holds his atoms together through mere force of will. Even a momentary lapse of concentration could case him to fly apart, and his has no idea how long it might take for him to re-coalesce. Though he is highly intelligent and a clever strategist, he is not subtle, and his slavish devotion to Unicron can cause him to lose sight of the big puicture. He has been outmaneuvered on more than one occasion. Transformers Cybertron: Balancing Act #3 - "Balancing Act (Part 2)"
Transformers Cybertron: Balancing Act #5 - "Balancing Act (Part 4)"
5,346 pages were recently viewed by 606 unique visitors. This page was viewed 1 times on Tuesday, April 23rd 2019 7:52am CDT. © 2019 Seibertron, Inc. DBA Seibertron.com. All Rights Reserved. Established June 2000. Seibertron.com is owned by Ryan Yzquierdo.